Table setting isn’t something that I was ever taught to do at home growing up. We lived a somewhat typical chaotic lifestyle in those formative years, but perhaps not so typical of my generation as a child was that my mother was a working mom. As a result, dinners were not informal, except for holidays when all of the relatives came to our home to dine. So table decorating was not something that I recall learning, like much of what I’ve learned as an adult it’s been self taught. Sometimes I feel like Wonder Woman (sans cape) who can teach herself anything and sometimes like a buffoon or perhaps a “Jill of all trades and master of none”! 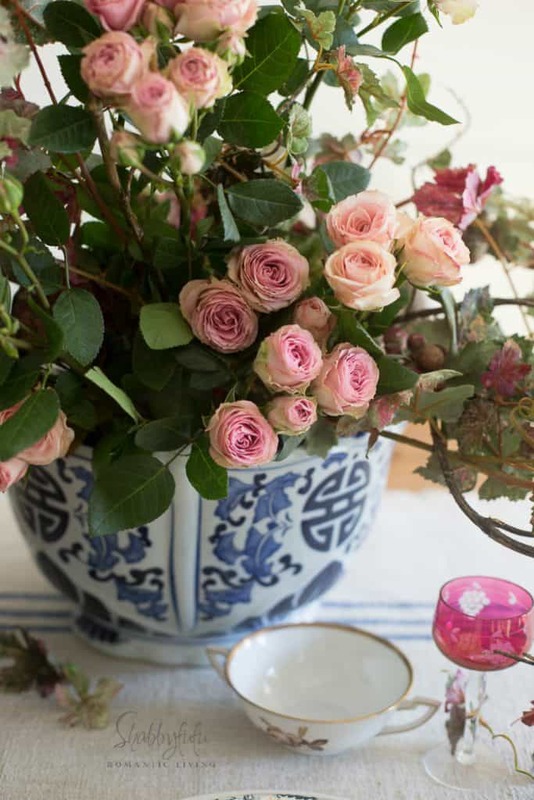 I do enjoy setting a beautiful table when I have the occasion to and I’m sharing a couple of tips today. I found the most terrific Chinoiserie pots last week at Ross (Ross Dress For Less) with an amazing price and I scooped them fast and literally threw them into my cart so that no one else could! The pots were how I started this tablescape and I filled them with flowers in early autumn-esque tones. One of my tips today is to not be afraid to mix faux flowers with real ones and I think that it’s hard to tell that I did so with these arrangements! More on these pots coming later in another post. There are no hardfast or set in stone rules really, but I generally start with the largest dinner plate first. If I have some charger plates around I’ll often use those. I don’t follow the formal etiquette rules and I know that chargers aren’t supposed to be left on the table, but if I use them I leave them because I like the way that they look. 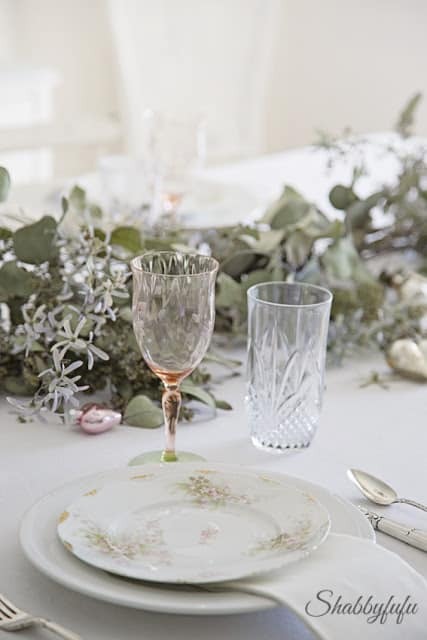 For this post I didn’t have any close by but I’ve found THESE CHARGER PLATES that I love and they look like white lace! Although I do have a dinner set or two, or three (or just maybe….more;-) I prefer to mix and mingle. Most of the plates that I own are vintage and/or antique and I love the way that a triple stack of plates looks mixing OLD AND NEW PIECES. 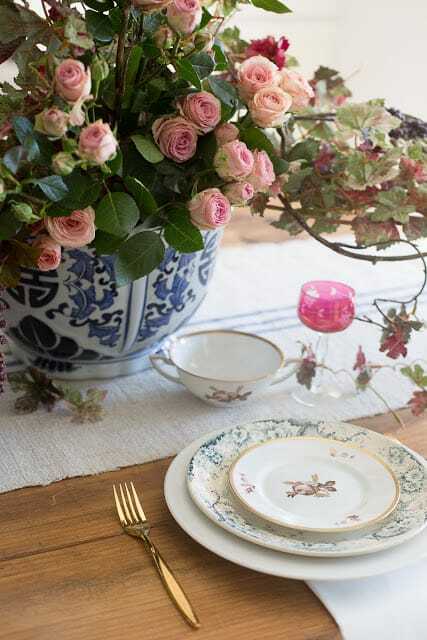 I used a common white dinner plate (my every day plates) first above, then layered with my treasured antique French blue ironstone plates and the top plate is from an set of pale French Limoges porcelain. The white ties the blue and the pink together and I’m a rebel in putting patterns that may not exactly be matchy-matchy in a room anyway (so why not on a table). I’ve had my heart set though on some ARTE ITALICA WHITE PLATES though…and you’ll find them at my affiliate link to take a look:-). 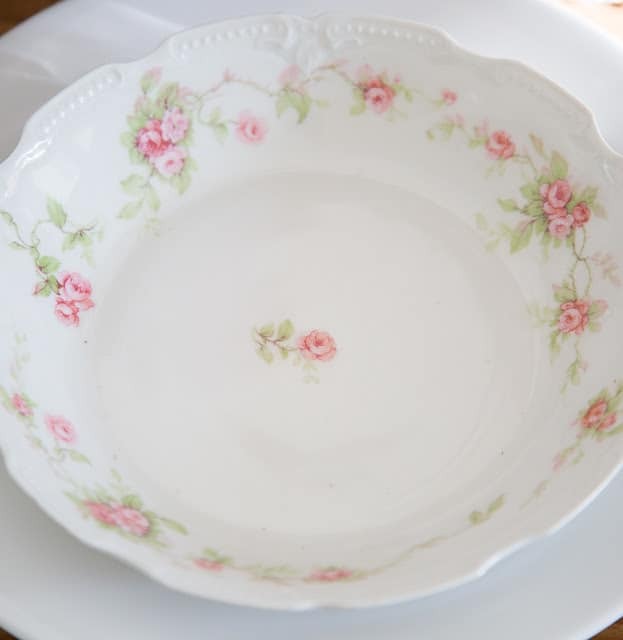 White on white is always chic and you can often find single plates and bowls at the flea market or yard sales to intermingle in a setting with white backgrounds. 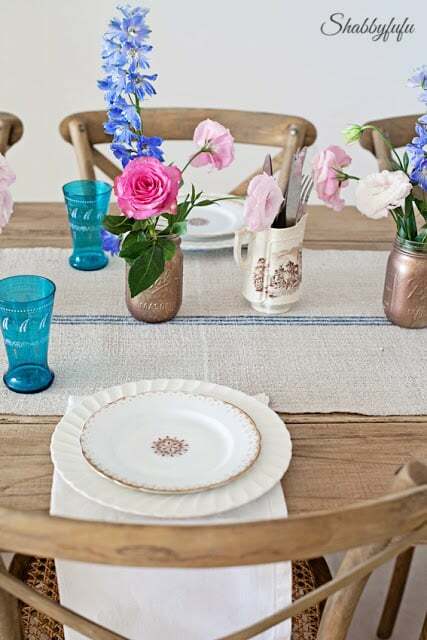 For a pretty girlfriend’s over lunch setting I often use just a pair of plates stacked. Layering two plates is generally enough for an informal meal with a buffet salad served on the top plate and a main course on the bottom plate. White plates rule once again! A better look at my old French ironstone…I use these plates often. 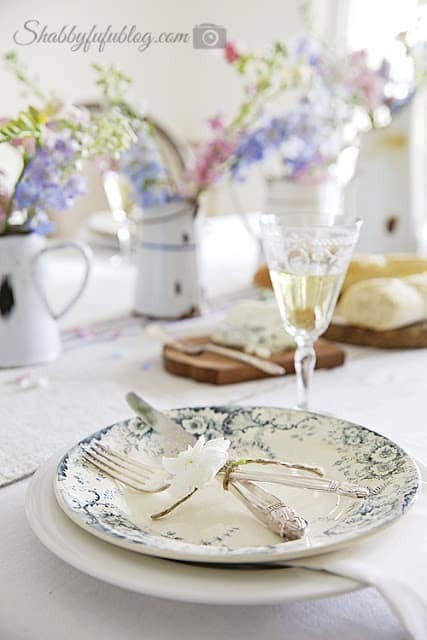 A simple fork and knife that are antique silver are tied with a piece of string and a flower for a French farmhouse feel. 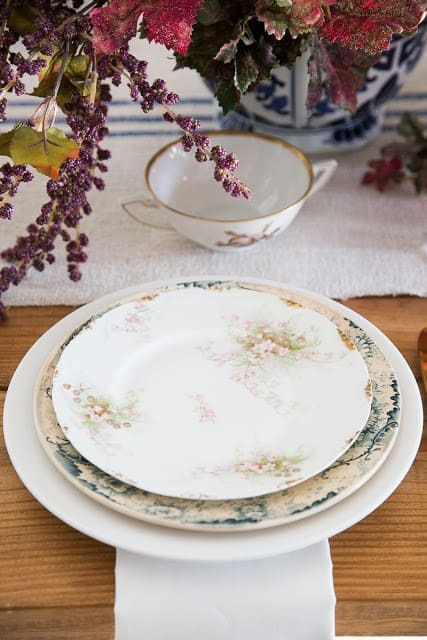 I’ve been researching a new set of WHITE IRONSTONE DINNERWARE and found THIS SET that is well rated, affordable and beautiful! A SETTING FOR FALL last year mixing up a double stack of plates in white and an unusual lavender. They are old French ironstone plates and I treasure these pieces! 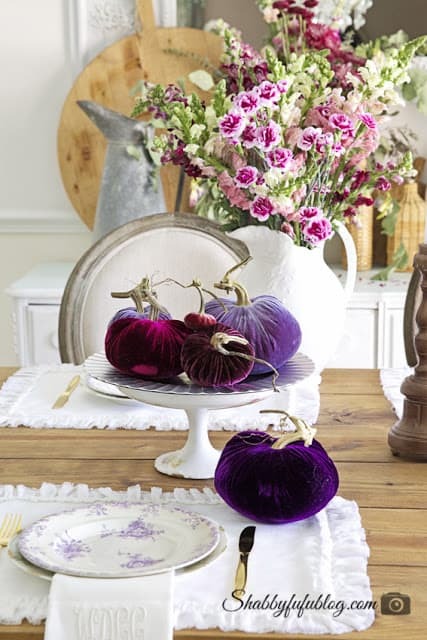 On the compote in the center of the table I use one PLATE CHARGER to create a flat surface for the heavy VELVET PUMPKINS. I hope that you enjoyed the post and as always, I’m here for any questions. Have a great week ahead! I am just wondering what you do with the antique plate when you have layered three plates together. You use the first plate for a salad or an appetizer. 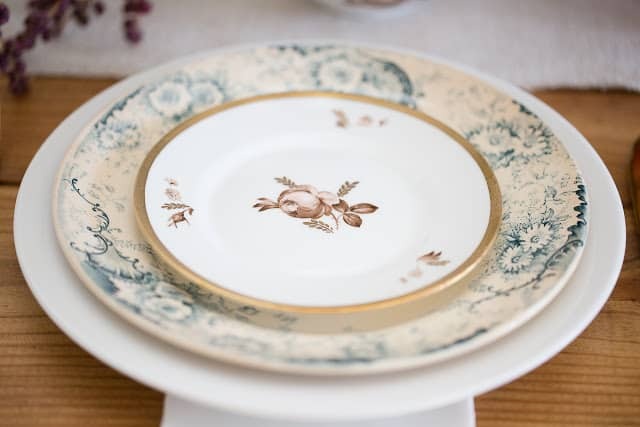 Then do you just remove the antique plate from your guests? Just wondering how you handle that. Let me know how my Instagram tip works out for you!